The weather here has been mild but with no appreciable wind. 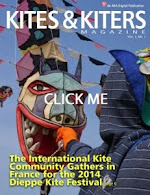 So... here's some kitefliers eye candy from the 2012 Wildwood, New Jersey Kite Festival. I hope you enjoy it.